This study analyses the temperature and precipitation dependence among stations in the Mediterranean. The first station group is located in the eastern Mediterranean (EM) and includes two stations, Athens and Thessaloniki, while the western (WM) one includes Malaga and Barcelona. The data was organized in two time periods, the hot-dry period and the cold-wet one, composed of 5 months, respectively. The analysis is based on a new statistical technique in climatology: the Copula method. Firstly, the calculation of the Kendall tau correlation index showed that temperatures among stations are dependant during both time periods whereas precipitation presents dependency only between the stations located in EM or WM and only during the cold-wet period. Accordingly, the marginal distributions were calculated for each studied station, as they are further used by the copula method. Finally, several copula families, both Archimedean and Elliptical, were tested in order to choose the most appropriate one to model the relation of the studied data sets. 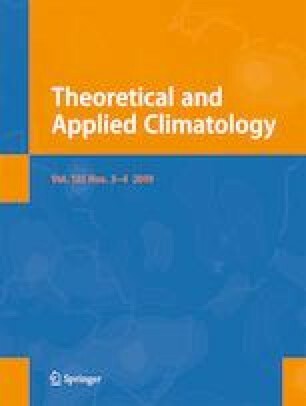 Consequently, this study achieves to model the dependence of the main climate parameters (temperature and precipitation) with the Copula method. The Frank copula was identified as the best family to describe the joint distribution of temperature, for the majority of station groups. For precipitation, the best copula families are BB1 and Survival Gumbel. Using the probability distribution diagrams, the probability of a combination of temperature and precipitation values between stations is estimated.